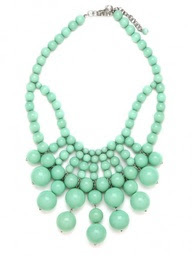 Got an email from Baublebar yesterday : the necklace I wanted for the longest time was back in stock ! Unfortunately, they only ship USA so you need a real good American friend to help you out ! Thanks Diane, I dedicate this post to you. Looking forward when that parcel falls in my mailbox ..
That's really pretty, love the soft color of it! me too Diane, I'm really in love with minty colors !